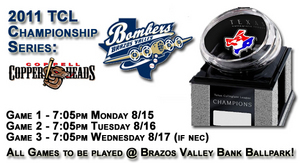 The Brazos Valley Bombers will take on the Coppell Copperheads for the TCL championship. The Bombers earned their spot by defeating the nationally ranked East Texas Pump Jacks in the TCL Divisional playoff series. The Bombers dropped Game 1 in front of their home crowd, but jumped on the Pump Jacks pitchers early in Game 2 and 3 to win the series and advance to the Championship round for the first time in their history.